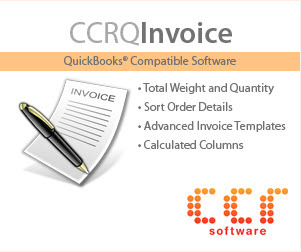 When you create a purchase order in QuickBooks the quantity that you have on outstanding PO’s will show in several reports. 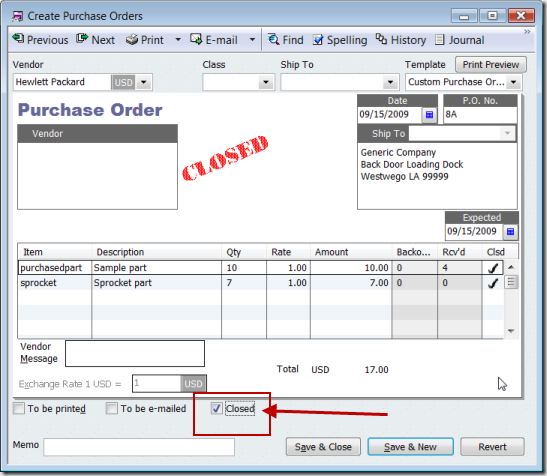 If you receive a partial shipment on that PO and the remaining balance will not be shipped, you need to close the purchase order to remove the outstanding items on these reports. There have been a number of questions about this lately, so here is an article. In my test company I have entered a simple purchase order for a couple of parts. In this simple test case I don’t have any of the purchasedpart items on other PO’s, sales orders, invoices, or pending builds, so all you see is the 10 On PO in the inventory stock status by item report. Now let’s enter a bill and receive some of the items. For the sake of discussion I’m going to receive just 4 of the purchasedpart item, and none of the sprocket item. Here’s what the PO looks like now. And here is what the inventory report shows. The question that I see asked often is how do you cancel the unshipped items? We don’t want to see that value in the On PO column any more. There are a couple of ways of handling this. 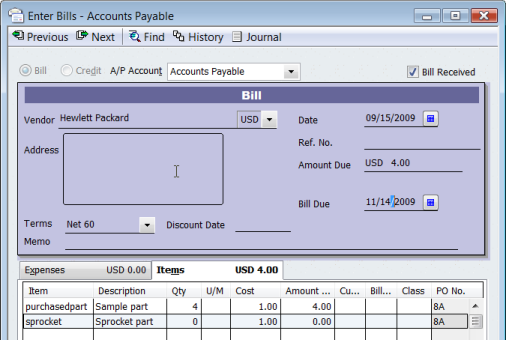 If you want to close out just a portion of the PO, put a check in the Clsd column. This will close just that line, leaving the rest open. Note that the backordered column is now set to zero. The On PO column in the stock status report will no longer show a value for this item. If the entire PO is canceled, check the Closed box on the bottom of the form. This closes all lines so that the items don’t show on the report, and changes the status of the PO so that it won’t show on any reports as an open PO. We currently only purchase items for a specific order by customer and therefore for the last 5 years all of our parts/items are set up as non-inventory parts but are posted to a COGS account. We don’t generally need to keep track of them other then for items that we have received at the end of a financial qtr and have not yet billed out for. This is currently manually calculated. 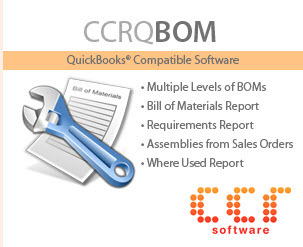 We are considering changing all of our items to inventory parts in order to work better with Connectwise and Quosal. What are the consequences of doing so (how will it effect past reports) and is there a better option (such as creating all new items rather than changing the existing ones)? Thank you, all I needed to know was that I could checkmark an line item to close it. The smallest things can give you a headache if you don’t know the answer. Very helpful! Glad I could help, Naomi! I am trying to close out old POs that will not be received on further. Many of these open POS are old, and in some cases, the PO may have been partially received. Others may not be showing as closed, but we’ve received all of the parts against this PO. When we went to clean up the open POs and close them by selecting the “Closed” box at the bottom of the PO, something happened and all of our prior financial statements changed. Changes were in the inventory accounts and in COGS. 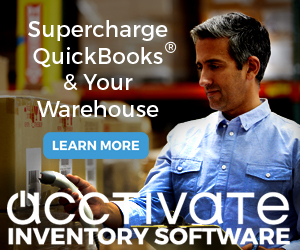 We use Rapid Inventory in conjunction with Quickbooks. Do you have any idea why this error may have occurred? Heather, a PO isn’t a financial transaction so it shouldn’t affect your financials. On the surface, I would say that you need to talk to the Rapid Inventory people first, to see if their product is looking at PO’s and doing something behind the scenes. I’m not that familiar with Rapid Inventory so I can’t say if that is the root of the problem or not. Heather, I have experienced the same thing but we do not use Rapid Inventory. I use QB without any add-ons. In most cases our items are non- inventory but some were. I closed PO’s and it changed the same accounts. I also agree with Charlie a PO should never affect financials since there is no GL posting but it did. I was on a support call for almost 5 hours and they could not figure it out as I was able to demonstrate through various reports and audit tracking this did happen. I have a lot of open PO’s and partially received PO’s since 2009 that I will not close due to this issue. I also have not seen a solution to this issue in any forums so if there is one please let me know. I recently upgraded to 2014 Premier and I have not tried it again. and save the purchase order. Shirley, I’m not sure I follow you on this. You have a PO, you do a partial receipt. You leave the unreceived items on the order, because you are going to receive them later, and later on you can receive those. Or, if you aren’t going to receive the rest, you close the PO. We have quite a few very old purchase orders that are open. The administrator tried to change a few settings but the error keeps on occurring. Could you perhaps assist resolving this issue? Someone has set a “closing date” on the file, which essentially locks you from making changes before that date. There should be a way to enter a password to get past that date, but you might not recall it. And I’m surprised that you got this error for a purchase order. Make a backup copy of the file, then receive any remaining items. That should close the PO. 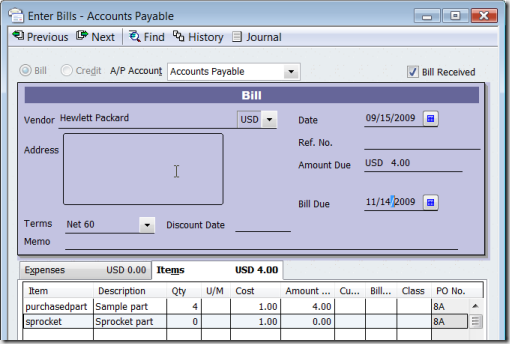 Then you can enter an adjustment to reverse the receipt. Try that, and if you don’t like the effects (compare your financial statements from before and after these transactions) then you can restore the backup.